Cura-Heat Back Pain Max Size are twice as large as the regular Cura-Heat Back Pain patches. This makes them perfect for those who need to cover a larger area of their back or for people who suffer from severe back pain. For lower and upper back. 12 hours of warming relief. 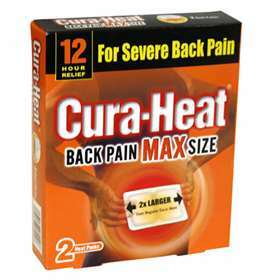 Cura-Heat Back Pain Max Size provides 12 hours of warming relief from Muscular and joint aches and pains. The patches can be attached to clothing or underwear at the source of pain. The patches are fragrance-free, non-medicinal and have a thin, discreet design. Open the sachet, remove and unfold the heat pack. Peel away the protective sheet from the back of the heat pack. Adhere to the clothing/underwear over the painful area. After use slowly peel off the heat pack. Never apply the heat packs directly against the skin.